April 2017 – In early April, the MOTOR JIKOV Strojírenská a.s. company completed installation of a CNG filling technology type MJ Variant 4K – 1120 l in Bucharest – Bragadiru for the bus company S.C. COMANTO 94 S.R.L.. This is a technology consists of four MJ Compact 05 units on the joint performance of twenty cubic meters per hour and 1,120 litre storage tank. This power is sufficient to completely fill the four CNG minibuses per day. The station is installed on the premises of the private bus company intercompany and began to serve for filling IVECO CNG minibuses. These vehicles will provide daily roundtrips to passengers on the Bucharest – Pitesti route and back. The company S.C. COMANTO 94 S.R.L. is only the second transportation company in Romania that has started to use environmental minibuses in its portfolio. “It’s only the first step and in the future we plan to expand the number of minibuses to a total of twelve vehicles. Another route is Bucharest – Mangalia and back. Of course, we will then increase the capacity and performance of our filling technology,” said Gheorghe Ghitulescu, the owner of the company, when clarifying the company’s plans. Currently, the only public CNG filling station in Romania is in Ramnicu Valcea and can therefore, according to the head of international sales at CNG v MOTORU JIKOV Strojírenská a.s. Karol Suchár, talk about a truly pioneering age of CNG. “We are negotiating with other cities and transport companies about a possible transition to compressed natural gas. 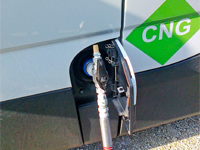 Leaving aside the environmental side of things, in Romania the ratio of price per kilo of CNG compared to the price of one litre of gasoline is far more economical for compressed natural gas than elsewhere in Europe,” said Karol Suchár.